other metals pertaining to a building or structure. The Code of Virginia § 59.1-117 requires a permit to be obtained and held by any person selling or acquiring any secondhand building fixtures. What are Secondhand Building Fixtures? "...secondhand heating or plumbing fixtures or supplies, electric fixtures or any wiring, gas fixtures or appliances, water faucets, pipes, locks, bathtubs, gutters, downspouts, or other secondhand fixtures of whatever kind or description pertaining to a building or structure." If the material is a metallic fixture or object that is physically attached to a building or structure and not simply plugged into an electrical outlet, it is considered a secondhand building fixture. What are not considered Secondhand Building Fixtures? Metal cans; vehicle parts; electric appliances like refrigerators, stoves, and washing machines; window air conditioning units; metal furniture; batteries; tools; lawn mowers. Who needs a permit to sell Secondhand Building Fixtures? A permit is required for "non-exempt persons, businesses or entities who sell, buy or obtain (even if free, "picked," or found) secondhand building fixtures." This permit is required for persons who may occasionally sell secondhand building fixtures, but do not exceed 600 pounds of material or 26 transactions over the course of a year. The process of obtaining this type of permit is simple: download the permit form, complete the information, and take the permit with you to the scrapyard. >> Download and complete the Permit for Sale or Acquisition of Secondhand Building Fixtures (PDF). Peddlers (referred to in the Code as "Dealers" or "Junk Dealers") permitted under § 59.1-118; If you are classified as a peddler, "dealer" or "junk dealer", you will need to obtain a Secondhand Building Material Dealer Permit Application listed below. Persons who regularly sell secondhand building fixtures that total over 600 pounds of material or 26 transactions over the course of a year are considered junk dealers. To become a junk dealer you must apply for an annual permit with the Roanoke County Police Department. Even though junk dealers are exempted from obtaining a permit for the individual sale or acquisition of secondhand building fixtures/materials, they are still required by law to keep a detailed record of their transactions. To obtain a junk dealer permit, fill out the dealer permit application and submit to the Roanoke County Police Department, 5925 Cove Road, Roanoke, Virginia, 24019. Please make an appointment prior to coming to the Police Department. An appointment may be made by contacting the Office Support Specialist at (540) 777-8641. Approved applicants will then be given a permit number. Junk dealers must report any transactions to the Roanoke County Police Department on the next business day following the transaction. The junk dealer permit application and reporting forms are available below to download or printed copies may be picked up at the Roanoke County Police Department. A person who regularly engages in the business of purchasing, acquiring, or canvassing secondhand building material, including all nonferrous scrap metal, proprietary articles, or both, for the purpose of resale and has conducted transactions involving, or has offered for sale, more than 600 pounds combined weight of secondhand building material or enters into more than 26 combined transactions annually. See Virginia Code § 59.1-116.1. Any licensed plumber, electrical contractor, HVAC contractor, or building and construction contractor. See Virginia Code § 59.1-116.1. 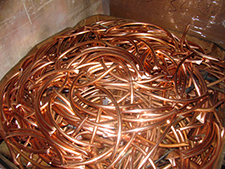 Any person who is engaged in the business of processing motor vehicles into scrap for remelting purposes who, from a fixed location, utilizes machinery and equipment for processing and manufacturing ferrous and nonferrous metallic scrap into prepared grades, and whose principal product is metallic scrap. See Virginia Code § 46.2-1200. For more information about the applications and permits required to sell or obtain Secondhand Building Materials, email the Roanoke County Attorney's Office or call (540) 772-2071.